Banksy’s street art is probably the best-known in the world, despite his anonymity. His use of stencil-like imagery to question authority and the status quo has popped up on street corners and walls all over the world, sparking controversy about ‘what is art?’ and challenging people’s views on whether street art could be considered graffiti and vice versa. It has also made people question aspects of life, and the way we accept so much in our culture, despite obvious contradictions to our beliefs. Regardless, his work has found a place in society, and has been reproduced countless times for commercial purposes. It can now be found in the household- on people’s walls as canvas prints, as well as on mugs, t-shirts and greeting cards. Because of his works’ popularity, it was only a matter of time before someone decided to take a creative step further in the reproduction of Banksy’s famous images. Using a completely different medium to the traditional spray-paint style, professional photographer Jeff Friesen has recreated and ‘spoofed’ a collection of Banksy’s artworks using the classic building-block brand Lego (an irony in itself really, considering how mainstream and commercial the brand is). 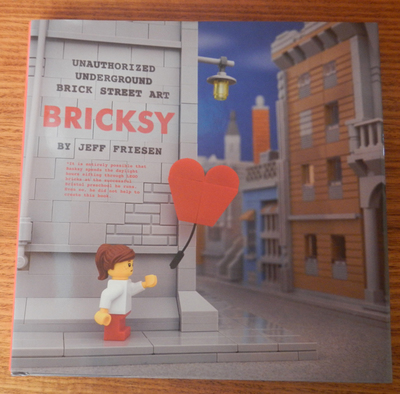 Friesen, along with his daughter, spent hours recreating each scene (with their own spin on it in some cases) using pieces of Lego from their home collection, and then painstakingly taking photographs for the production of this book, Bricksy. Each recreated scene has a thumbnail image of the original Banksy artwork underneath it, so that those unfamiliar with the work (or those who can’t quite grasp the concept) can see where the image and idea originated from. Each Lego design also has an added quote attached that puts the picture on the page into further perspective. This gift book is quite clever and would be perfect for Lego lovers and those who appreciate Banksy’s work in a different format. The photos are vibrant, humorous and mostly recognisable, and clearly highlight the popularity of street art, Banksy’s artworks, and of course, Lego.